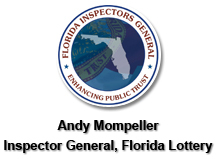 The mission of the Florida Lottery Office of Inspector General is to protect and promote public integrity and accountability within the Agency through audits and investigations that detect fraud, waste, abuse, and administrative violations. The goal is to prevent and decrease the reoccurrence of such violations through employee awareness and cooperation while providing the Agency with a timely, accurate, objective and useful work product that promotes confidence and provides transparency for the citizens of the State of Florida. The Inspector General is chartered and governed in Section 20.055 of the Florida Statutes. The Inspector General reports directly to the Chief Inspector General and administratively to the Florida Lottery Secretary. The Inspector General serves as the Chief Audit Executive for the Agency. The main functions within the Office of Inspector General, which include internal audits, investigations, and accountability services, are designed to comply with Florida Statutes and to assist the agency in meeting its mission and goals. The Office of Inspector General staff is responsible for providing objective and independent reviews of the Agency and must conduct themselves in a professional and ethical manner. Staff members must ensure that they are knowledgeable of and comply with the Agency's Standards of Conduct. Personnel are to comply with the Codes of Ethics for the Institute of Internal Auditors (IIA), ISACA, Association of Inspectors General (AIG), as well as Commission for Florida Law Enforcement Accreditation (CFA) standards. The Commission for Florida Law Enforcement Accreditation Standards Manual for Offices of Inspectors General. Ensure that an appropriate balance is maintained between audit, investigative and other accountability activities. Commission for Florida Law Enforcement Accreditation (CFA).